This wine is one of the true protagonists of the 2015 vintage. The 2015 Chianti Classico Gran Selezione Vigneto Bellavista offers an unreal level of intensity and depth with profound darkness and perfectly integrated tannins versus acidity. This wine was not produced in 2014. This vintage only saw 4,200 bottles made. The wine pours forth with rich fruit that is tightly woven within the wines generous texture. Spice, smoke and tobacco appear as brief afterthoughts. Despite the beauty of the bouquet, this wine is ultimately all about the finesse and the elegance of its mouthfeel and that subtle game it plays alternating between brawn and grace. Vigneto Bellavista is bellissimo. "Doctorwine" has rated the wine "Castello di Ama Vigneto Bellavista, Chianti Classico Gran Selezione DOCG, Italy" from the vintage 2001 on 01.01.1970 with 95 of 100 points.
" Made from 90% sangiovese and 10% malvasia nera. I wrote about this wine when its first vintage, the 1978, came out, and since then I have followed the coherent progression of its vintages. It comes from the higher part of Gaiole in Chianti, from a vineyard lying approximately 450 metres above sea level. It has a very bright and intense ruby colour and a complex, variegated bouquet, with notes of sour cherries but also balsamic and faintly smoky hints, against a background of tobacco and freshly-mown hay. The flavour is frank and just a little edgy, thanks to acidity that initially makes it a bit intractable, but then allows it to age very well indeed. Its tannins are evident without being aggressive, and the finish is subtle and extremely long, without any hint of bitterness. Serve it at 20Â°C, matching it preferably with a grilled Chianina beef steak, but also with roast chicken and potatoes or roast leg of lamb. " "Wine Spectator" has rated the wine "Castello di Ama Vigneto Bellavista, Chianti Classico Gran Selezione DOCG, Italy" from the vintage 2011 on 01.01.1970 with 94 of 100 points. "Falstaff Magazin" has rated the wine "Castello di Ama Vigneto Bellavista, Chianti Classico Gran Selezione DOCG, Italy" from the vintage 2013 on 01.01.1970 with 92 of 100 points. "Wine Enthusiast" has rated the wine "Castello di Ama Vigneto Bellavista, Chianti Classico Gran Selezione DOCG, Italy" from the vintage 2011 on 01.01.1970 with 90 of 100 points. "Falstaff Magazin" has rated the wine "Castello di Ama Vigneto Bellavista, Chianti Classico Gran Selezione DOCG, Italy" from the vintage 2011 on 01.01.1970 with 93 of 100 points. "Huon Hooke" has rated the wine "Castello di Ama Vigneto Bellavista, Chianti Classico Gran Selezione DOCG, Italy" from the vintage 2007 on 01.01.1970 with 96 of 100 points. 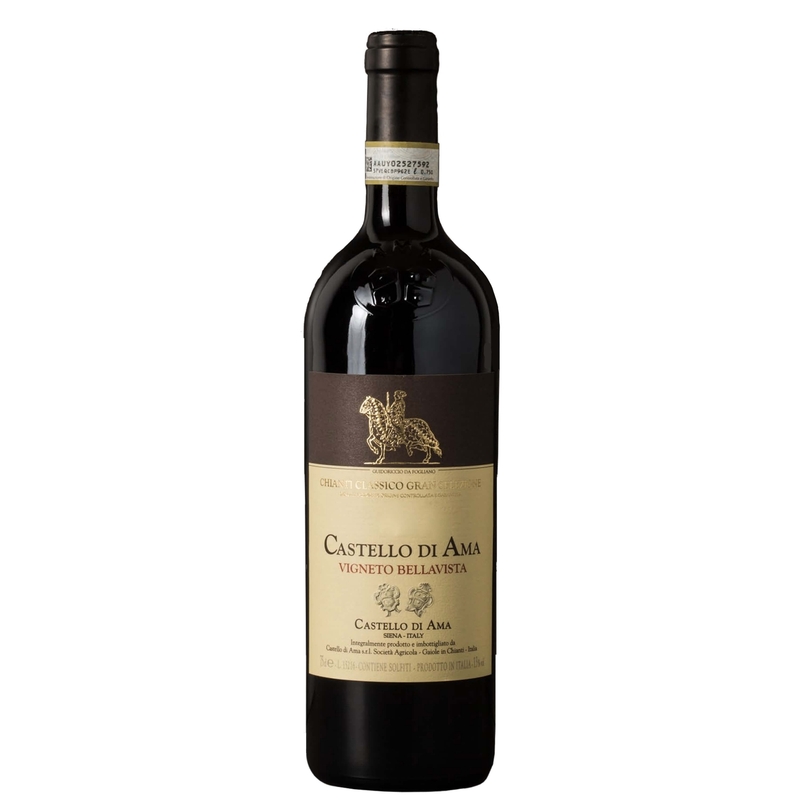 "Robert Parker The Wine Advocate" has rated the wine "Castello di Ama Vigneto Bellavista, Chianti Classico Gran Selezione DOCG, Italy" from the vintage 2007 on 01.01.1970 with 97 of 100 points. "Robert Parker The Wine Advocate" has rated the wine "Castello di Ama Vigneto Bellavista, Chianti Classico Gran Selezione DOCG, Italy" from the vintage 1988 on 01.01.1970 with 97 of 100 points. "Robert Parker The Wine Advocate" has rated the wine "Castello di Ama Vigneto Bellavista, Chianti Classico Gran Selezione DOCG, Italy" from the vintage 2004 on 01.01.1970 with 96 of 100 points. "Robert Parker The Wine Advocate" has rated the wine "Castello di Ama Vigneto Bellavista, Chianti Classico Gran Selezione DOCG, Italy" from the vintage 1995 on 01.01.1970 with 96 of 100 points. "Robert Parker The Wine Advocate" has rated the wine "Castello di Ama Vigneto Bellavista, Chianti Classico Gran Selezione DOCG, Italy" from the vintage 1999 on 01.01.1970 with 96 of 100 points. "Robert Parker The Wine Advocate" has rated the wine "Castello di Ama Vigneto Bellavista, Chianti Classico Gran Selezione DOCG, Italy" from the vintage 2006 on 01.01.1970 with 95 of 100 points. "Robert Parker The Wine Advocate" has rated the wine "Castello di Ama Vigneto Bellavista, Chianti Classico Gran Selezione DOCG, Italy" from the vintage 2001 on 01.01.1970 with 95 of 100 points. "Robert Parker The Wine Advocate" has rated the wine "Castello di Ama Vigneto Bellavista, Chianti Classico Gran Selezione DOCG, Italy" from the vintage 1990 on 01.01.1970 with 98 of 100 points. "Robert Parker The Wine Advocate" has rated the wine "Castello di Ama Vigneto Bellavista, Chianti Classico Gran Selezione DOCG, Italy" from the vintage 1982 on 01.01.1970 with 96 of 100 points. "Vinous Antonio Galloni" has rated the wine "Castello di Ama Vigneto Bellavista, Chianti Classico Gran Selezione DOCG, Italy" from the vintage 2004 on 01.01.1970 with 96 of 100 points. "Wine Spectator" has rated the wine "Castello di Ama Vigneto Bellavista, Chianti Classico Gran Selezione DOCG, Italy" from the vintage 2007 on 01.01.1970 with 93 of 100 points. "Falstaff Magazin" has rated the wine "Castello di Ama Vigneto Bellavista, Chianti Classico Gran Selezione DOCG, Italy" from the vintage 2007 on 01.01.1970 with 92 of 100 points. "Wine Enthusiast" has rated the wine "Castello di Ama Vigneto Bellavista, Chianti Classico Gran Selezione DOCG, Italy" from the vintage 2006 on 01.01.1970 with 90 of 100 points. "Vinous Antonio Galloni" has rated the wine "Castello di Ama Vigneto Bellavista, Chianti Classico Gran Selezione DOCG, Italy" from the vintage 2007 on 01.01.1970 with 96 of 100 points. "Vinous Antonio Galloni" has rated the wine "Castello di Ama Vigneto Bellavista, Chianti Classico Gran Selezione DOCG, Italy" from the vintage 2006 on 01.01.1970 with 94 of 100 points. "Falstaff Magazin" has rated the wine "Castello di Ama Vigneto Bellavista, Chianti Classico Gran Selezione DOCG, Italy" from the vintage 2006 on 01.01.1970 with 91 of 100 points. "Wine Spectator" has rated the wine "Castello di Ama Vigneto Bellavista, Chianti Classico Gran Selezione DOCG, Italy" from the vintage 2006 on 01.01.1970 with 95 of 100 points.